What if there was a way to make a gold sequin cake better and faster without using any sequins at all? That’s exactly what the “Confetti Already” Simpress™ does. Marvelous Molds is proud to introduce the “Confetti Already” Simpress™ which will enable anyone to make the incredibly popular “Gold Sequin Cake” faster, cheaper and much more delicious. Did you know that it can take $20.00 – $30.00 worth of edible sequins to cover an 8” cake? If you have ever made this trendy cake, you know the many time consuming steps required to pull it off. First you cover the cake with fondant, then you paint on piping gel (yuck), then you apply expensive, edible sequins by the handful until they all stick to the piping gel and cover the cake. Once all these steps have been completed, its finished off with a gold or silver color application to create a very cool looking cake. But ask yourself this question, who wants to eat all those hard sugar rocks on the outside of the cake? It’s oh so common to see guests at a wedding peeling the sequin encrusted fondant off their slice of wedding cake because, quite frankly, those sequins don’t taste very good. When using the “Confetti Already Simpress™” you simply press delicious fondant of your choice into the Simpress to create a texture that you would swear was made with individual edible sequins. 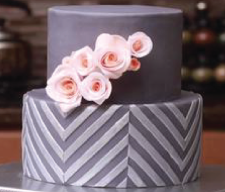 The “Confetti Already Simpress™” will trim your fondant into perfect panels that can be applied to a crumb coated cake for flawless results every time. The only step left is to apply your favorite color and “Voila”, you’re done. Just think how the “Confetti Already Simpress™” can empower you to make this wildly popular sequin cake for weddings, birthdays, anniversaries and more.